This Tribal Fish Hook mug is a great addition in your home or office. The mug holds 20 ounces and is dishwasher and microwave safe. It’s also a perfect gift for loved ones and friends. 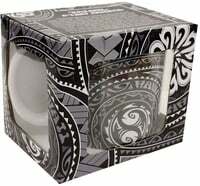 The beautifully designed gift box is included. Pros: We try to pick up one of these size mugs at Walmart every time we visit Kauai. Everyone that uses them comments on what a great size it is and we get asked all the time if we can purchase them for them on our next visit. Sadly the Walmart in Kauai doesn't seem to carry this size anymore so going to have to start ordering on line for gifts!